A dispute over the insurance carried by a Canadian energy firm will be heard by Wisconsin’s highest court Tuesday. The fight stems from one county’s requirement that Enbridge Inc. obtain special pollution insurance as part of the company’s plans to triple the amount of oil being sent through a pipeline running across the state. Enbridge’s Line 61 pipeline corridor runs through the land next to Keith Reopelle's property in the small village of Marshall in Dane County. He and his wife Trish moved there after their daughters, Kestrel and Teal, graduated from high school about eight years ago. "It's kind of like a little slice of heaven for us," Reopelle said. A creek runs by the western edge of his land, which rests on a 40-acre lot about a half-hour drive from Madison. Reopelle said it's a quiet, peaceful place where he can trade the sounds of the city for sandhill cranes and wood ducks. But, Reopelle, who is also director of the Dane County Office of Energy and Climate Change, didn't know the pipeline ran nearby when they built their home. He and other landowners are part of a lawsuit to enforce a county permit that required Enbridge to obtain $25 million in environmental impairment liability (EIL) insurance to build a pump station as part of its pipeline expansion. "Heaven forbid, if there ever was a spill here," Reopelle said. "But, if that does happen, we want the company to be responsible. We don’t want to be the next Kalamazoo River situation here in our backyard." Enbridge, which built Line 61 a decade ago, began obtaining approval five years ago to triple the amount of oil carried through the 462-mile pipeline from its Superior terminal to the Illinois border. The company built the line with enough capacity to handle up to 1.2 million barrels per day. As part of the upgrade, Enbridge built a dozen pump stations along the route, including the Waterloo station in Dane County. The county’s zoning and land regulation committee began exploring a conditional use permit for the project in late 2014. County officials and climate action groups like 350 Madison wanted to protect landowners from any liability after witnessing the impacts of the 2010 Kalamazoo River spill in Michigan. Oil from Enbridge's Line 6B spilled into the nearby creek and river for more than 17 hours before it was reported. The cleanup recovered more than 1 million gallons of oil and cost the company $1.2 billion. "Our zoning committee had some concern that Enbridge provide some assurance that they had the financial responsibility to completely remediate any potential catastrophic spill," said David Gault, assistant corporation counsel for Dane County. The county later contracted — and Enbridge paid for — an insurance consultant to evaluate the company’s coverage to determine whether it had sufficient resources to protect the county in the event of a spill at the pump station. County officials and environmental advocates were also concerned because Enbridge was involved in litigation with its insurer over covering costs from the 2010 spill. The company couldn't recover $85 million from one insurer as part of claims on the Line 6B release, according to a 2017 annual report. David Dybdahl, president of American Risk Management Resources Network, recommended Dane County require Enbridge to buy $25 million in EIL insurance. "It is designed to cover pollution losses specifically and it specifically covers cleanup costs where a general liability policy doesn’t define that at all," said Dybdahl. Dybdahl said Enbridge had a general liability policy that contained time element pollution exclusions, which meant any spills had to be discovered and reported in a certain time frame to obtain coverage. In April 2015, the zoning committee approved a permit for Enbridge that incorporated Dybdahl’s recommendation. Not long after, Enbridge appealed the decision to the Dane County Board and lawmakers intervened. In July 2015, lawmakers slipped a last-minute measure into the 2015-2017 state budget through its 999 motion to block Dane County's insurance requirements. The provision said a county couldn’t require an interstate hazardous liquid pipeline operator to obtain insurance if the company already carries comprehensive general liability insurance that covers sudden and accidental pollution. When asked about it by reporters, Assembly Speaker Robin Vos, R-Rochester, said at the time that Republicans have always supported the idea of local control, but it's difficult "to have one county hold up that project" when projects have received permission from multiple levels. "We adopted a proposal ... to basically allow for what happens in almost every other circumstance where they have all the requirements of the federal government, all the requirements of the state," said Vos. "They’re going to do it in a safe way, but we want to make sure we have an opportunity for those jobs and an opportunity to get that project done." Enbridge said it didn't request or have a role in writing the insurance provision passed by lawmakers. Dane County ultimately kept the permit’s insurance requirements in place despite the change in state law. Enbridge challenged the additional insurance requirements in Dane County Circuit Court, alleging the requirements were unlawful. A group of landowners filed a lawsuit not long after to enforce the county’s permit. A Dane County judge dismissed the landowners’ suit and ruled in Enbridge’s favor, striking the insurance conditions from the county’s permit. The company built its Waterloo pump station, which is operational. But the county and landowners appealed. Dane County argued the permit should be sent back to the county’s zoning committee. The landowners agreed and argued Enbridge hadn't actually proved it carries the insurance necessary under the provision passed by lawmakers. A three-judge panel ruled in their favor. Now, the case will be heard by the Wisconsin Supreme Court. Attorneys for Enbridge, Dane County and the landowners have filed briefs making their case on the insurance dispute. The case has also attracted the attention of the state’s powerful business lobby Wisconsin Manufacturers & Commerce. WMC submitted a non-party brief in support of Enbridge that claims Dane County’s insurance requirements are an effort to undermine state law, creating uncertainty in Wisconsin’s business climate. "Wisconsin has over 3,200 miles of petroleum pipelines traveling through more than half of its counties," reads the brief. "These pipelines could not properly function if local governments decided to act in a manner similar to Dane County, jeopardizing Wisconsin’s energy supply." The Wisconsin Department of Justice had also filed a brief under the Walker administration in support of Enbridge the day after the November election. However, the agency under the Evers administration withdrew it earlier this month. A DOJ spokeswoman did not return requests for comment on its withdrawal. Enbridge argues the county’s insurance requirements are unlawful and that landowners had no authority to enforce a provision that violates the law. The company’s lawyers also argue the permit hadn’t taken effect before lawmakers intervened because it was under appeal before the Dane County Board of Supervisors. In addition, they noted the county had several opportunities to reconsider Enbridge’s permit after officials acknowledged the insurance conditions were unenforceable. "We carry more than $900 million of insurance coverage, which is more than sufficient. It includes coverage in the rare case that we do have an incident or a spill from our system," said Jennifer Smith, Enbridge’s community engagement manager for the Midwest. The company also said it has sufficient financial and operational resources to respond to any spill regardless of its coverage. In addition, Enbridge could access up to $1 billion from the federal government's Oil Spill Liability Trust Fund. However, county officials and environmental groups fear a transition to renewable energy could make a company that transports fossil fuels less financially stable. Enbridge points to the company diversifying its operations. In 2017, the company merged with Spectra Energy, which transports natural gas. Smith said the company sees natural gas as Enbridge’s bridge to a lower carbon footprint, adding it has around $8 billion in renewable energy assets. Gault, Dane County’s attorney, argues the permit, which was ruled unenforceable by the circuit court, should have been sent back to the county’s zoning committee for review. He contends a Dane County judge’s ruling to strike the insurance conditions from the permit undermined the committee’s authority. "It was very clear that the insurance conditions were such an important and integral part of issuing the permit," said Gault. Gault said the county never considered issuing the permit without the insurance conditions. Attorneys for the landowners agree and argue Enbridge has yet to prove it carries the insurance lawmakers mandated to prevent counties from issuing additional requirements. Dybdahl, the county’s insurance consultant, noted Enbridge only provided him with a summary of its coverage, citing trade secrets. But, he thinks that shouldn’t prevent them from presenting the documents in court, and landowner Reopelle agrees. "If they have insurance that they think is adequate, you’d think the easiest way to convince people of that would be to take out the insurance policy and walk into the courts and say here it is. Look at it," said Reopelle. Enbridge’s attorneys argue the provision passed by lawmakers doesn’t require the company to provide complete policies to show that it carries the coverage. But, Dybdahl also contends the type of insurance included in the measure passed by lawmakers hasn’t been sold in decades. He said insurers dropped the words "comprehensive," "sudden" and "accidental" from their policies in 1986 after an influx of claims related to cleaning up legacy contamination at Superfund sites. Instead, he said insurers began offering "commercial" general liability policies that contained coverage with time element exclusions. Dybdahl said such policies could theoretically cover property damage or cleanup costs from pollution if it’s reported to the insurer within the specified time period. As Enbridge argues its case in Wisconsin, the company has already agreed with regulators in Minnesota that it will at least seek out the type of insurance Dane County required in its permit. 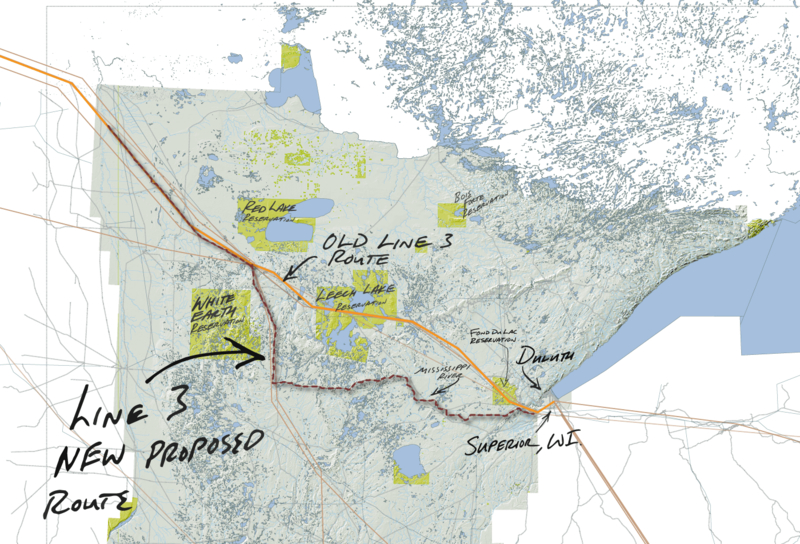 Enbridge will try to procure $200 million in environmental impairment liability insurance as a condition of building its $2.9 billion Line 3 replacement project across northern Minnesota. "That is looking at one large artery of our system, so we’ve agreed to look at that," said Enbridges's Smith. "Here in Wisconsin, we had one pump station, which is just one piece of our larger artery that’s in our system." If the company can’t obtain the coverage, Enbridge must demonstrate to Minnesota the insurance is unavailable to similar pipeline companies. Smith said there’s a limited marketplace for that type of insurance with no guarantee they could always maintain it under the requirements in Dane County’s permit. "If we couldn’t do that, that would put us in violation of the conditional use permit and affect our operations," she said. Enbridge argues the Waterloo pump station is a critical piece of its infrastructure that allows the company to transport a majority of the crude oil that’s refined in the Midwest for products used every day. "We have obligations to not only our shippers who we’re shipping the products for to these refineries, but also to our general use here in the Midwest and in the U.S.," said Smith. "By having a condition on something that is relying on outside forces — forces outside of our control — that makes it unsustainable." The company hopes the Wisconsin Supreme Court will allow the Dane County permit to stand without the insurance requirements. But the county and landowners like Reopelle hope they’ll be able to use whatever means available to protect landowners from the risks of a potential spill.